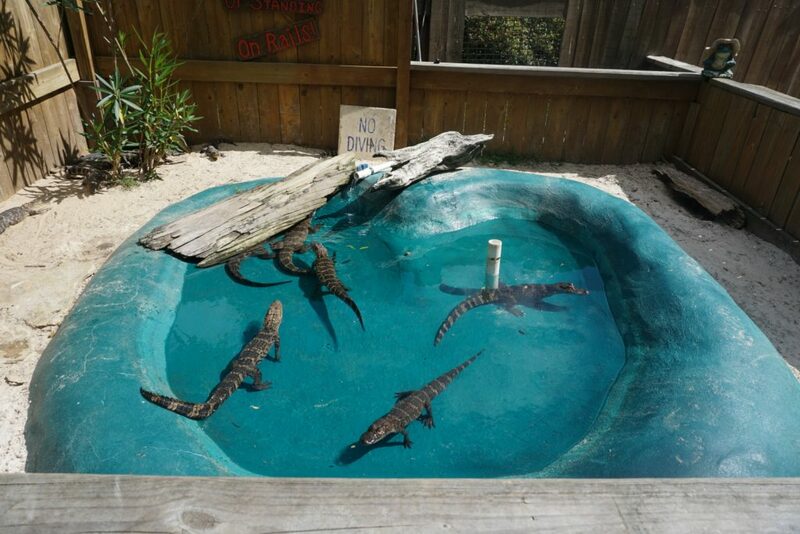 We get asked a lot what it’s like to work with alligators. The truth is, it’s just like a normal 9-5 job – minus the office cubicles and add in colleagues with much sharper teeth. Most days are about the same, but everyday keeps us on our toes. So, we decided to give our readers a little insight into a typical day on the farm. We start each day with our morning rounds. We call in all the “kids” and check to see that everyone got along through the night, make sure there were no fights, no escapes, and no break-ins (our security team is pretty robust, so that’s not usually something we have to worry about). Once we’ve accounted for all of our reptile friends, it’s time for daily maintenance. We drain all the ponds, refill them and everyone gets a bath… Everyday. Then it’s into the walk-in freezer to check out the food stock. A typical inventory includes about a dozen feral pigs that have been turned over by one of our wildlife specialist friends who’s helping control the undomesticated population. The next step is food prep… We’ll leave out the specifics. When meal prep is done, we grab the leaf blower, clear off paths, pick up trash and check off any others tasks to make sure everything’s ready to open up! 10:00 a.m. – Doors open! 11:00 – First feeding of the day. These guys are HUNGRY. We try to make it a show that’s worth your while. After lunch, it’s time to meet and greet, talk to customers, and welcome tourists and locals alike. We try to answer all questions and make sure everyone is up to speed on what to expect during their visit to the farm. Surprises and alligators aren’t a relaxing combination. Usually things slow down a bit after the second feeding. If you’re not into crowds, this is the time to make your appearance. Depending on how busy the first two feedings were, more food might need to be prepped. We usually go through about 200 pounds of pig per day… Told you these guys were hungry. 4:00 – Last feeding of the day. Come and get it! After that, it’s time to start winding down. 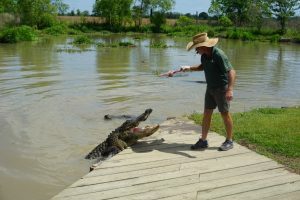 We make sure everyone has cleared the walking trails, put the baby alligators back in there home with a little fresh water, and start on food prep for the next day. It’s a good time to check off some regular maintenance to-dos and take care of any repairs needed. 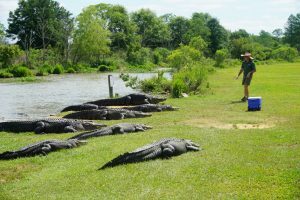 And that’s a day in the life of an alligator farmer. Now, we didn’t mention the field trips and birthday parties, which are always a good time. 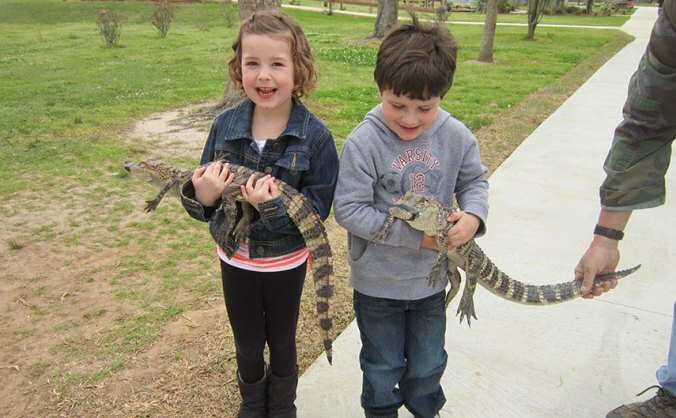 Some days we’ll make a trip to check on our alligator friends in the area. You may have seen some of them at places like Ralph and Kacoo’s in Mobile. Other days we’re helping with an alligator on the loose. No matter what we have on our agenda, we hope you’ll pick a day to come visit us soon!